If I had to pick a government policy that would be most upsetting to our Founding Fathers, I’d be tempted to pick the income tax. Or maybe some useless agency, such as the Department of Housing and Urban Development. After all, surely the Founders didn’t envision – or want – today’s Leviathan government in Washington. But I also know I’m biased since I work on fiscal policy issues. So upon further reflection, I think the policy that would be most horrifying to the Founding Fathers is so-called civil asset forfeiture, a.k.a., theft by government. You may think I’m joking or exaggerating, but theft is the right word when you look at how citizens (such as the Dehko family and Lyndon McClellan) have had their bank accounts seized even though they were never even charged with a crime, much less ever committed a crime. And now we have a new example that would have the Founders rolling in their graves, but also should get every decent person angry. Reason has a report with the odious details. …the Drug Enforcement Administration (DEA), is snatching the life savings of a young black male for the crime of being alone on a train. The man, Joseph Rivers, 22, was traveling from Michigan to Los Angeles by train with $18,000 in cash to pay for a music video. In Albuquerque, DEA agents boarded the train and started asking people questions. They got to Rivers, who told him he was going to shoot a music video and agreed to let them search his stuff. Now put yourself in the mind of Mr. Rivers. You’re not committing a crime. You’re not in possession of any drugs or other illicit substances. Agents ask to search your stuff as part of their snooping on the train and you figure being cooperative is the best way of allaying suspicion (regardless of whether the DEA used profiling). And what’s your reward for being cooperative? The Reason report then shares some very ugly passages from a story in the Albuquerque Journal. Rivers was the only passenger singled out for a search by DEA agents – and the only black person on his portion of the train… In one of the bags, the agent found the cash, still in the Michigan bank envelope. Mr. Rivers explained why he had the money, but it didn’t do any good. “I even allowed him to call my mother, a military veteran and (hospital) coordinator, to corroborate my story,” Rivers said. “Even with all of this, the officers decided to take my money because he stated that he believed that the money was involved in some type of narcotic activity.” Rivers was left penniless. Here’s perhaps the most disturbing part of the story is the way government bureaucrats openly admit that they can take money without any criminal charges, much less a conviction for any crime. Just imagine how the Founding Fathers, if they were still around, would react to the statements of this bureaucrat? Imagine what they would think of a policy that gave bureaucrats arbitrary powers to take money from citizens? By the way, I’m not asking these rhetorical questions because I have some inside knowledge that Mr. Rivers is a stand-up guy. Maybe his story was fake and he actually was going to buy illegal drugs. I’m tempted to point out at this point the foolishness of the Drug War, but that’s the point I want to make today. Heck, we can assume he had $18,000 because he intended to commit a real crime. Perhaps he was going to pay a hit man to kill someone. At the risk of being repetitive, so what? Our Constitution was set up to constrain the powers of government and protect citizens from abuse by government. We have a 4th Amendment to protect us from unreasonable search and seizure and we have the presumption of innocence so that we can’t be punished unless that’s the outcome of a proper legal proceeding. Needless to say, allowing agents to steal money from train passengers is not what the Founding Fathers had in mind. In a just society, there shouldn’t be shortcuts which trample people’s rights. Real police work should be used to amass evidence of real crimes, which then should be used in real courts where a jury can decide on guilt. Let’s close with a few more passages from the Albuquerque story. Rivers, 22, wasn’t detained and has not been charged with any crime since his money was taken last month. That doesn’t matter. Under a federal law enforcement tool called civil asset forfeiture, he need never be arrested or convicted of a crime for the government to take away his cash, cars or property – and keep it. Agencies like the DEA can confiscate money or property if they have a hunch, a suspicion, a notion that maybe, possibly, perhaps the items are connected with narcotics. Or something else illegal.Or maybe the fact that the person holding a bunch of cash is a young black man is good enough. …Meanwhile, Rivers is back in Michigan, dreaming, praying. “He’s handed this over to God,” his attorney said. Which seems infinitely safer than handing over anything further to government agents. I’ll make one final point. In the absence of some evidence to the contrary, I’m not going to accuse the DEA agents of racial profiling. After all, government agents have stolen money from plenty of white people. But I strongly suspect there was economic profiling. If Mr. Rivers was a 50-year old white guy in a business suit, the DEA probably wouldn’t have confiscated the money. That doesn’t mean, by the way, that 50-year old white guys should rest easy. When government bureaucrats get away with stealing money from young people without power and connections, it’s probably just a matter of time before others get victimized as well. Just keep in mind that slippery slopes are very slippery when government is involved. P.S. Also keep in mind that asset forfeiture has become such an abusive nightmare that the first two heads of that division of the Justice Department now say the policy should be abolished. P.P.S. I don’t know what’s riskier, riding trains while black or banking while Russian? P.P.P.S. 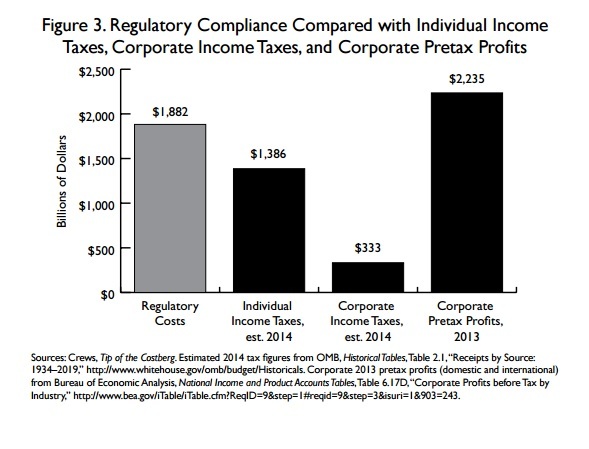 On a separate matter, the good people at the Competitive Enterprise Institute periodically measure the overall cost of regulation and red tape on the American economy. Their latest version of Ten Thousand Commandments was just released and it is very depressing reading. Here are two charts (out of many) from the study. The first looks at the annual cost of federal rules. 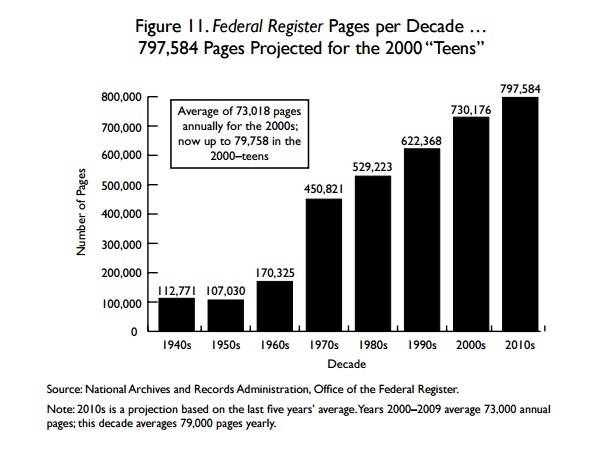 The second chart looks at how the regulatory burden has grown over time. As I said, very depressing. No wonder Santa Claus wasn’t happy with the end-of-year gifts he received last year from the Obama Administration. Has civil asset forfeiture ever been challenged in federal court? I don’t see how it could survive. But then again, I don’t see how The Supremes found the authority in the Constitution for the federal government to force me to buy health insurance, or to approve the taking of private property to give to a development company (Kelo), or to claim that growing wheat for private consumption was interstate commerce (Filburn). The Constitution clearly says, “No person shall be … be deprived of life, liberty, or property, without due process of law;” Nevertheless, our government now routinely deprives people of their property with NO process of law. Does anyone take the argument that it is the property and not the person that has been charged with a crime seriously? I mean, do the people who say this really believe it? I read an article once by an FBI official defending this practice, and the gist of his argument, I wish I had the exact quote but it was a while ago, was that asset forfeiture is a vital tool for law enforcement because sometimes it can be very difficult to convict a person of a crime. In other words, we need to be able to impose fines on people without convicting them of a crime because sometimes we don’t have any evidence. I suppose the next step is to declare that the person’s clothes committed a crime so that we can put his clothes in jail … with him inside them. Measures against drugs, money laundering and other such crimes are also very badly targeted. I recently brought money into the US to buy a house. I had to transfer it in tranches that were all under $40,000 – because that is the amount that triggers automatic investigation. I didn’t know this, of course, because moving money in this quantity is a once in a lifetime event for me. Fortunately the company transferring the money did. I will go out on a limb here and suggest that actual drug dealers and money launderers are very familiar with these rules and NEVER get caught by them. Maybe he was going to start a business and make money, in which case he would have eventually owed the rest of us, the people, a lot of tax money. So we took his money preemptively, just in case. …and he’s lucky that in our day and age “we, the People” are nicer. In past times we would have not only taken his money, but our agents may have dragged him out of the train and crucified him by the railroad tracks. Majoritarian goals in a democratic society come above individual rights. We must even accept the occasional speculative collateral damage that comes with the pursuit of unifying everyone into common communal causes. Only this way we can ultimately build a just and prosperous society that keeps us all Americans in the world’s lucky top five percent. We are sorry that Mr Rivers lost his money — if indeed he meant no harm and if indeed he was going to use the money for the overall benefit of his community — a big if. But it’s better this way. Think of all the school library books, the children’s vaccines, the community daycare lunches that we will be able to buy with Mr River’s funds. They may even sweep my street tomorrow. And I have nothing to worry, because I never use big sums of cash, and neither do the majority of my voting buddies. And besides, since we’re the majority, who’s gonna stop us anyway? They steal your money and you must buy a lawyer to try to get it back. This is the job creation we have today. The IRS does the same thing with no racial profiling. What bothers me the most is that the bureaucrats are deaf to all explanations. Were the agents tipped off about this guy and his money? Reason magazine usually has an ax to grind so I assume there is more to this story. I hope this attention will result in the return of his money. Confiscating property because of a ‘hunch’ is reprehensible. No outrage, media coverage or protests for Mr. Rivers. Just crickets. Asset forfeiture is an especially galling policy since it hits multiple nerves at once. It not only is an affront to rule of law but an affront to reason as well. The idea that inanimate objects can be charged with a crime leaves such gaps in logic that any further encroachments desired could be justified. How long can it be from here before we see search warrants issued based on the presumptive guilt of an automobile or house?